PACLINE is well known in the industrial world for its high quality conveyor products and expertise in custom designed systems for a wide range of manufacturing and warehousing operations. Now PACLINE has developed its complete Garment Handling conveyor system. This storage and retrieval system utilizes their highly versatile enclosed tube track conveyor along with The RETRIEVER™ control system. 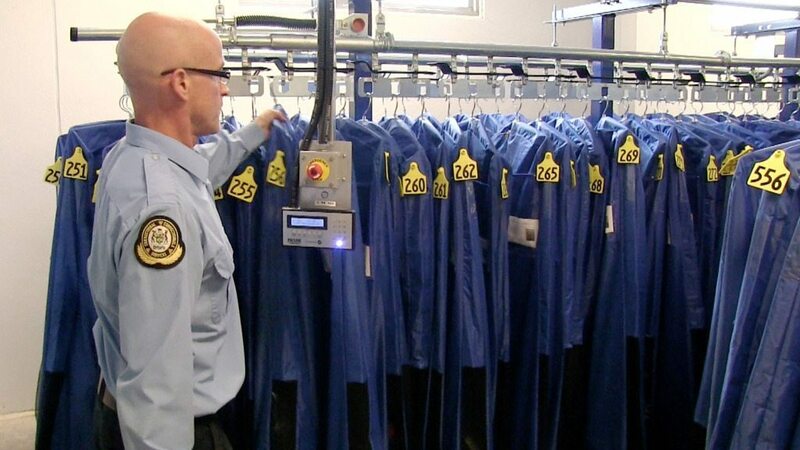 Improved safety for operators is a major benefit of The PACLINE Garment Handling system. The PAC-LINE™ enclosed track design eliminates dangerous pinch points which are common in many other conveyor designs. This is an extremely important consideration for garment handling conveyors where the hands and fingers of the operators can come into contact with the track and moving chain. The PAC-LINE™ system is also compact and modular and with a wide range of tight radius track curves that can be easily configured for virtually any space. Most Garment Handling systems are often installed in much smaller and often atypical spaces compared to industrial applications so this has become an important reason why customers have chosen the PAC-LINE™ system for their Garment Handling solution. Quite operation is another benefit that customers in the Garment Handling industry say makes PACLINE’s system an excellent choice in this application area. The moving chain is enclosed inside the conveyor track, which reduces noises compared to other conveyor styles. All parts and components are prefabricated and stocked in our warehouse so they are ready to ship. Accessory products such as storage racks, dust shields and garment bags are also now available from PACLINE.